Finally! Trusource pure water in your home! The WaterBox was designed to deliver the highest quality water for the lowest possible price with the same exceptional service our commercial customers have come to expect. It’s time for homes across Montreal, Ottawa and Quebec City to experience the ultimate in pure water. What’s so special about the WaterBox? Fits underneath any kitchen sink and does not require electricity to operate. 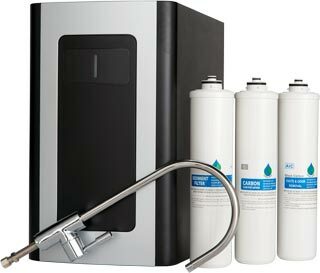 Uses a 4-stage Reverse Osmosis (RO) purification system — up to 50 gallons of pure drinking water per day. 2.3 gallon, stainless steel tank housed inside the unit keeping the water contaminant-free. A designer lead-free faucet that is sure to look great in any home. One complete RO system with a full 1-year warranty. Installation by a certified Trusource H2O Canada technician.